Is it counting my chickens before they hatch if I post on here that one of my pieces will be appearing on the back of a glass supplier catalog, if I do so before I actually have the catalog in hand? I have the email saying it was chosen… and I would think that they wouldn’t tell people until they were ready to print, or mail. right? 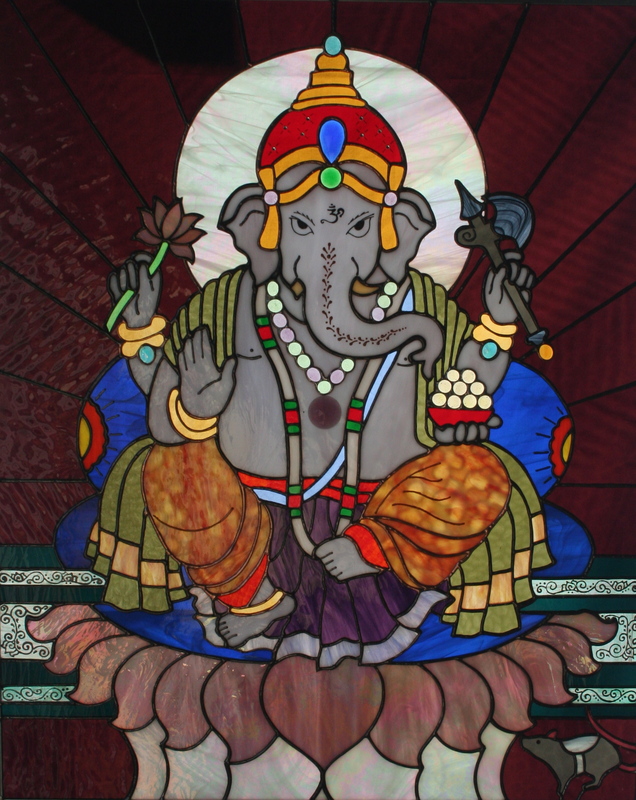 So Ganesha will be chilling all over the country in assorted glass work stations and bookcases. I think that is very cool. And so does He, and He’s a God so His opinion counts. In other news, I will have my photography aid finished tonight. I am making a white screen to hang behind the glass when I photograph it, to help the colors pop. I called around to get quotes on having a pro do it, but it just too expensive. I am hoping that this screen with diffuse the light enough to illuminate the pieces uniformly and correctly. we will see. I’ll post photos when I have them. ~ by kellig on August 19, 2013.